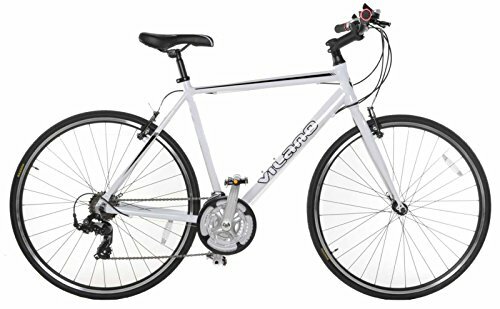 The Vilano Performance Flat Bar Commuter Bike has been built mainly to serve your commuting requirements but it can also be used for riding or exercising. The bike comes with 6061 Aluminium Hybrid Frame which makes it light and strong. The ride quality offered is quite enjoyable and the bike has the ability of going really fast. Shimano components have been used for gearing and with its 21-speed gear range, it offers to its riders a wide array of options to choose from. Alloy Linear Pull V-Brakes provide precision braking coupled with control and stability. 700c double-walled rims offer durability and strength. The bike comes with 2 H2O mounts, rear rack mounts and ergo saddle which is extremely comfortable and these features complete it as a commuter bike. This bike comes with the promise of performance, endurance, speed and a fun ride experience and if you are looking for a bike under a small budget that can deliver all these, then this bike is for you. Release date October 22, 2012. The bike comes with 6061 Double Butted Aluminium Frame; Hi-Tensile Steel Fork (Straight Blades); Shimano TX-50 3/7 Speed SIS Shifters; Shimano TX-51 Series Front Derailleur; TX-35 Series Rear Derailleur; Pro-wheel Triple Crankset (48/38/28T) with Chainguard; Alloy Stem; Sealed Cartridge Bottom Bracket; Shimano MF-TZ21 Freewheel(7 speed); KMC-Z Chain; KT Alloy Hubs (32 Hole) with Quick Release Feature; 700C Double Walled Rims with CNC Machined Sides; Alloy Linear Pull V-Brakes; 1-1/8th Alloy Integrated Headset; Alloy Riser Handlebar; Ergo Saddle and Alloy Seatpost. The Vilano Performance Flat Bar bike has the capability of going fast which is a rare trait for a commuter bike. Its speed can be attributed to its 6061 aluminium frame which makes the bike extremely light and agile. One of the most important features for a commuter bike is the ride quality and on that front, it delivers quite well on its promise; ride quality offered is extremely smooth. The bike offers a 21- speed gear range which offers to you a wide array of options to choose from and enables the bike to handle any kind of terrain. Gear shifts for this bike are not as smooth as expected and could have been a lot better. The wheels and the pedals of this bike are pretty low end which is the case with most of the bikes in this category and you might have to get those replaced for a smooth and hassle-free ride experience. Another thing that is missing from this commuter bike is the fender which should have been included as it claims to be hybrid commuter. Overall, the bike performs well and offers to you a complete package of comfort, speed, style and durability within a small budget. If you are looking for a commuter bike which can also be used for riding or getting some exercising, this one can be the perfect choice for you.